Theresa Gardener needs help with simple things. Such as putting on earrings or cutting food. 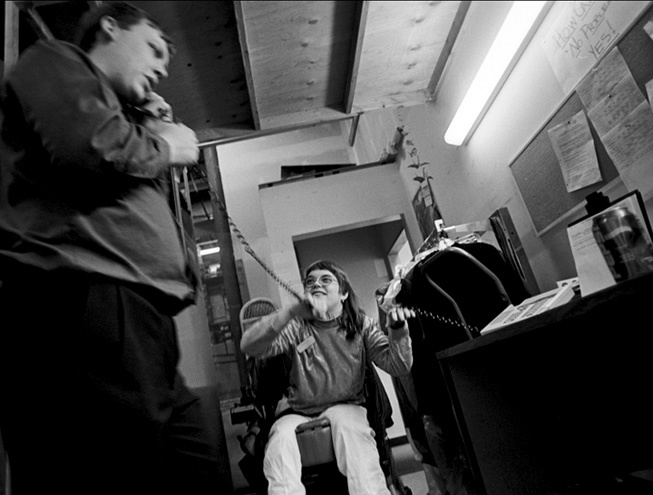 Theresa was born with cerebral palsy 25 years ago, and for a full year now she has lived on her own. 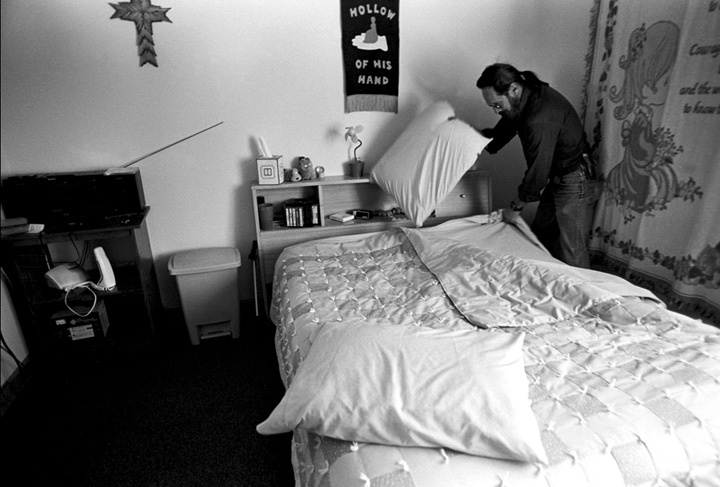 Every day, Don Atkins or another personal care attendant comes to prepare meals, do laundry, make up the bed. We were downstairs, in the waiting room of a handicapped-access building. I was about to take pictures of Theresa, helping her friend Judy with a special typing machine. 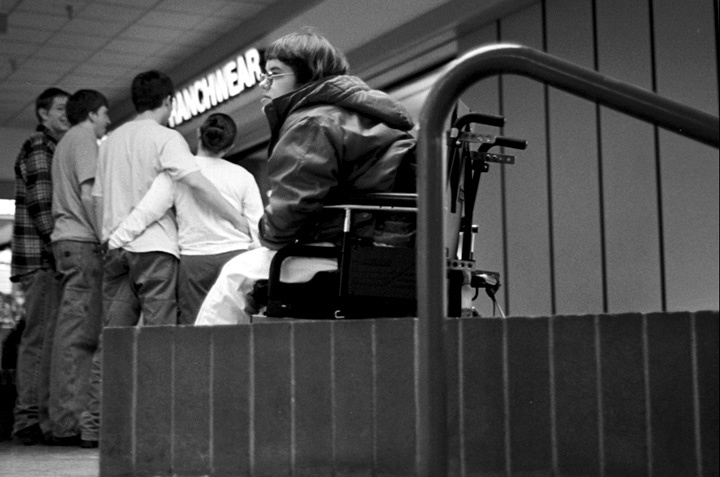 Both women have cerebral palsy and get around in wheelchairs. It was 9 p.m. and it was decided I would spend the night on Theresa’s floor. She’d asked around for more blankets, she told me. “Hi, Judy and Nellie, I am glad you are both here, because I have something to tell you,” says Butch, Judy’s boyfriend. Butch is big and rough, and scary. Oh, no, I think, he has come to tell us he’s changed his mind about this picture business, and wants my film destroyed and wants me out of here. “We have some comforters and blankets upstairs, and we can give those to Nellie tonight, so that it isn’t too hard for her on the floor,” he continues. I felt drowning in a wave of gratitude. 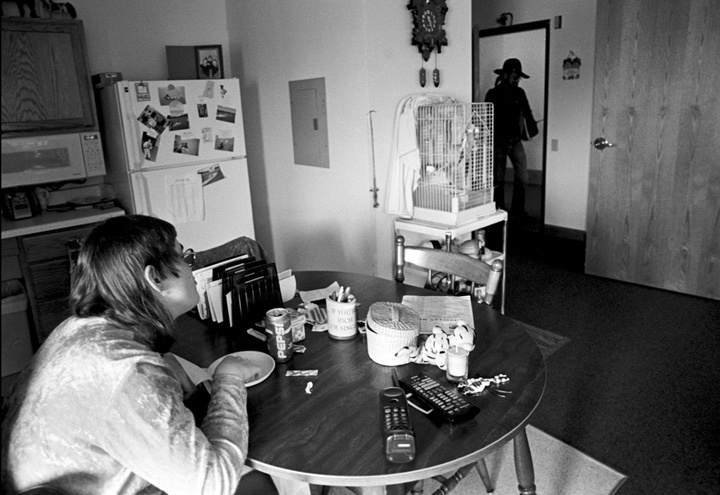 Theresa and her parakeet Joey live in a special building for people with disabilities, Queen City Estate. Don comes at 11 a.m. and stays for about an hour. Don got this job to prepare himself for the time he’ll have to take care of his wife, who suffers from Lupice. He tells Theresa the happy news that his 28-year-old daughter just got her GED. Don has to visit another dozen of people this day. He had major back surgery nine years ago and was supposed to be in a wheelchair within a year. He’s still walking around. Colleague Sandy McCormick helps Theresa get ready for going out. 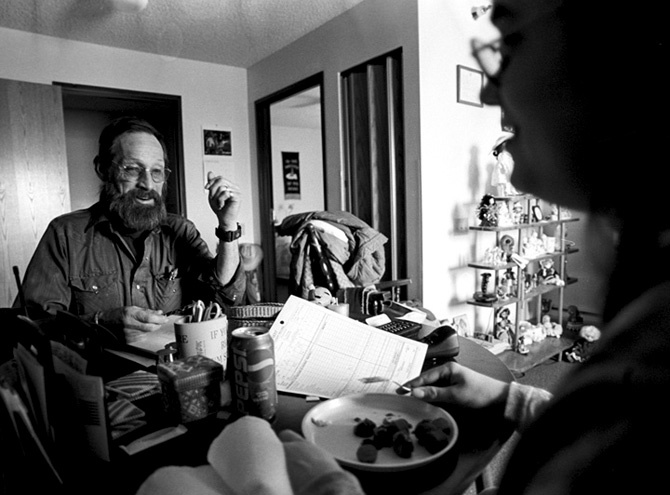 The two of them work at Montana Independent Living, an agency for assisting people with disabilities. Theresa’s other job is at JCPenny’s catalog department, where she makes calls. She likes to play jokes on colleague Gary Mooney, who’s snatched her phone while she was out on a break. 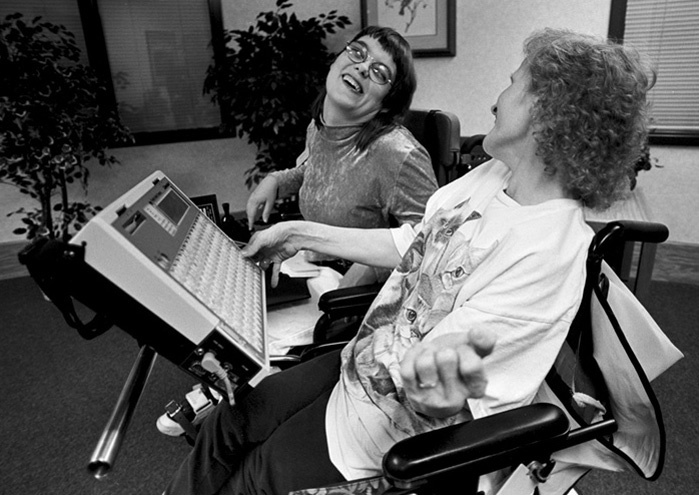 Twice a week Theresa helps friend Judy Backa with the Liberator. 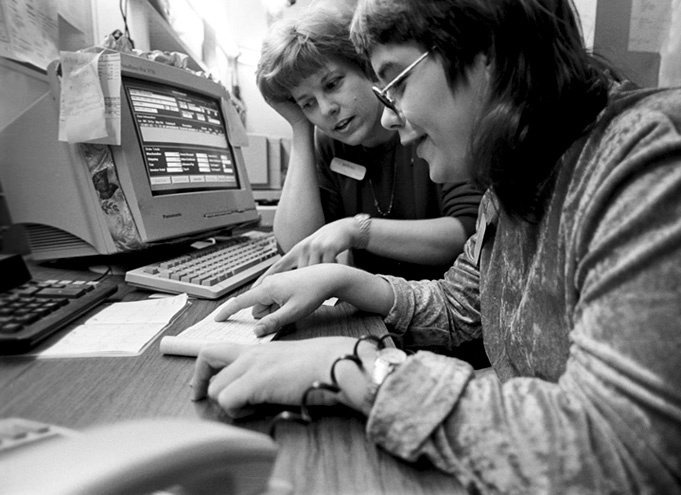 This special typing machine will speak what Judy has typed, thus enabling her to communicate. 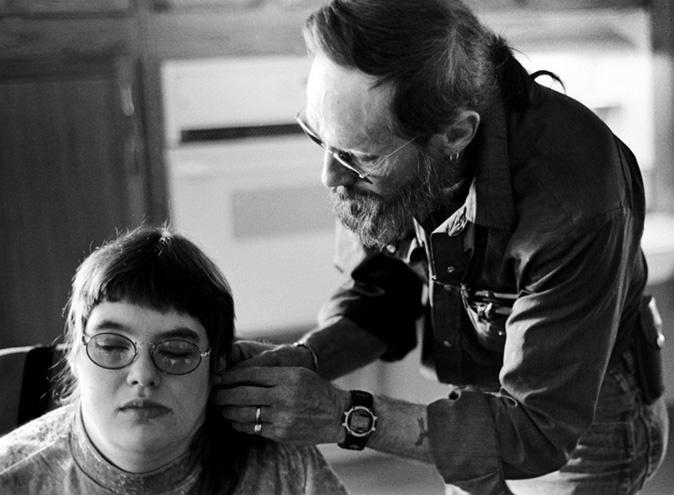 Judy was also born with cerebral palsy. 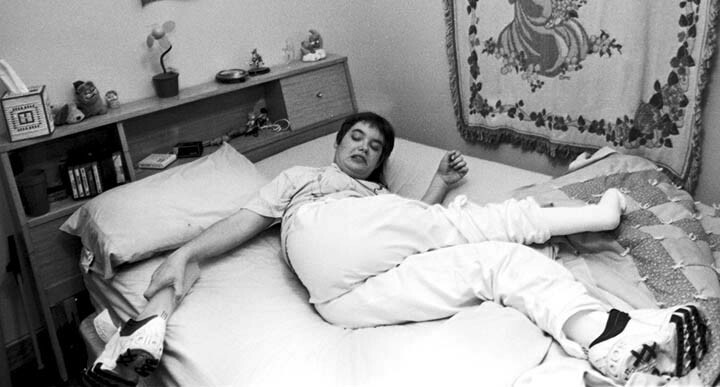 Once in bed, Theresa takes off the cast that enables her to stand on her feet. She has undergone 22 surgeries, one of which moved a bone from her leg to her ankle to enable her to stand up. She still needs the plastic cast to do so.